PowerPoint lets you insert an image in four ways. Which way is best and when should you use each method? It all depends on the result you want. When you place an image on the background layer of the slide master, you can easily apply the image to every slide in the presentation, or you can apply that master to one or more individual slides. The image automatically stretches to fill up the whole slide. It’s difficult to remove the image accidentally or inadvertently hide text behind the image. When you want to create one background for the entire presentation that fills the slides, this method is easy and effective. But make sure that text and other content is legible. Right-click, and choose Background/Format Background. In PowerPoint 2003, click the drop-down list and choose Fill Effects. In PowerPoint 2007 and 2010, with the Fill category active, click the Picture or Texture Fill option. In 2003, on the Picture tab, click the Select Picture tab to choose an image file. In 2007 and 2010, click the File button to choose an image file. When you place an image on the slide master, you can easily apply it to every slide in the presentation, or you can apply it to one or more individual slides. The image doesn’t automatically stretch to fill up the whole slide, so you avoid distorting the image. As with the previous option, it’s hard to remove or move the image accidentally, or lose text behind the image. When you want to add an image to every slide, this is a good option. In PowerPoint 2003, choose View > Master > Slide Master. In 2007 and 2010, choose View tab> Presentation Views group> Slide Master. This displays the slide master. In 2003, choose Insert > Picture > From File. In 2007 and 2010, choose Insert tab> Illustrations group> Picture. Choose an image file to insert. Select the image and move it to the desired location. You can also drag on a corner handle to resize it. Placing an image on the background of a slide applies the image to that slide only. The image automatically stretches to fill up the whole slide. It’s difficult to remove the image accidentally or inadvertently hide text behind the image. When you want to create a background for one slide that covers the entire slide, this is a good option. Right-click, and choose Background or Format Background. In 2003, click the drop-down list and choose Fill Effects. In 2007 and 2010, with the Fill category active, click the Picture or Texture Fill option. When you place an image on a slide, the image appears only on that slide and doesn’t automatically stretch to fill up to whole slide, so you don’t distort the image. When you want to place an image on one slide, and don’t want it to take up the whole slide, use this option. In 2003, choose Insert > Picture > From File or click the Insert Picture icon on the Drawing toolbar. In 2007 and 2010, choose Insert tab> Illustrations group> Picture. Choose an image file to insert. points and this never has happened. Does the same thing happen in a new presentation? Which version are you using? I’m not sure what you mean by small balloons. Does it happen when you insert clip art? I am new to designing presentations. However, reading Slide-ology has been VERY enlightening. Armed with this information along with the knowledge gained from the book, I am looking forward to creating dynamic visual slides in the future. Do you have an idea how can I insert an image to powerpoint in a way that the original properties of the image are not altered. I noticed that powerpoint modifies the image. Many thanks! What type of modification are you seeing, how are you inserting the image, and which version of PowerPoint do you have? Hi, I’m trying to insert an image into a table using Format Shape -> Fill -> Picture or Text fill. I do not want the picture to stretch up to the size of the cell i.e. i want the picture to retain its original size and shape when inserted in the cell. While putting text and picture on the same slide, which side (left or rigth of the slide) shall be used to paste the picture? I’ve heard people say both; some like left and some like right. I think it depends on which you want people to look at first, the text or the image. In most places, where people read left to right, the audience will look at what’s at the left first. They’ll also go from top to bottom. If you often use a slide with the title at the top and an image on the bottom, having the text on the left and the image on the right is similar. But in cases where you want people to look at the image first, you could switch it around. In truth, if you pause speaking just a second to let people take in the slide — a good practice — they’ll take in both pretty quickly (unless you have too much text on the slide) so it doesn’t make a huge amount of difference. How to insert same image or picture in all ppt slides without pasting them on each slides? Put them on the slide master. But be sure that the image doesn’t interfere with other content on the slides. Insert> Photo Album — easy! In 2003 Presentation a person could paste (Ctrl V) a photo to slide. In 2010 they took that ability away? You can still paste a photo, text, or anything. But it isn’t recommended — you may get less than optimal results. It’s better to save the image and insert it. I am having a frustrating problem when inserting images into my powerpoint presentation. Let’s say the slide is formatted to have picture with caption. I click on the image button and select my image. Rather than displaying the image in its correct size, Powerpoint instead stretches and centers the picture. This means it crops off the things I want while distorting the image to fill the box. It’s so frustrating and I have no idea how to stop this from happening. Previous versions of Powerpoint did not do this! You don’t say which version you’re using. I tried in 2010 and 2007 and got the same result. I’d suggest not using a picture placeholder. The purpose of the placeholder is to place an image within its boundaries and it will crop what doesn’t fit. Instead, create a custom layout (instructions at http://www.ellenfinkelstein.com/pptblog/create-a-custom-layout/) with the caption only. Insert the image and place it yourself where and how you want it. Same issue as other I cannot insert a picture into a table cell unless using the background option which strechtes the picture (not want we want). Word makes it in a split second and PPT 2007 use to do it easy. Any solution for this very simple need ? Matt, I’m not familiar enough with the Mac OS to help you, but you should try the Photo Album feature. It should be on the Insert tab, near where you insert pictures. It will let you select any number of images in a folder and will insert them, one per slide. I’ve never heard that the Mac version doesn’t have this feature, so I’m assuming that it does. It should make you very happy! I got problem placing picture placeholder on template master page. I put the placeholder into staqe, then I send it to back – everything looks OK here, I can place any shape over the placeholder, what looks cool with some transparency. But when I add new slide based on this template, image loaded into placeholder container stays always in front! I even tested this with one template delivered with PowerPoint and it looks the same. For me it’s a bug. How to insert a picture/diagram into the powerpoint slide that looks clearer? I am doing my presentation slides and I want use some pictures in my slides to describe some pathways but when I put the picture in, it becomes unclear and can not be read. currently I use powerpoint 2007..
I’ve never heard of that. Which slide layout are you using? re set image to the desired location. I can insert only 1 picture, as when I try to insert picture 2 it just goes on top of the 1st one. How do I access the 2nd slide box? Josie, What do you mean by accessing the 2nd slide box? When you insert a 2nd image on a slide, it will go on top of everything. In fact, anything that you insert, even a shape, goes on top. Once you insert it, you can drag it to the side so you can see the 1st image. Also, you can use the Selection pane, which I explain at http://www.ellenfinkelstein.com/pptblog/the-wonderful-selection-pane-lets-you-easily-hide-objects-select-them-and-even-rename-them/ and http://www.ellenfinkelstein.com/pptblog/reorder-objects-in-the-selection-pane/. (If you haven’t already done so, I recommend that you subscribe to my PowerPoint Tips Newsletter at http://www.ellenfinkelstein.com/ppt_submit.html and you’ll get new tips as they come out. Ellen – Thanks so much for this great tutorial. Can you tell me – when I insert a jpg onto a slide – not as a background – just as an image sitting on the page – is there a way to set it’s coordinates? Say I want it 200px from the top & 100 px from the left. is there a way I can do this? I’m in V. 2004 on a mac. Many thanks! Karen, I don’t have a Mac but it’s easy to do on a PC, so I’m sure you can do it on the Mac, too. I’ll write a blog post with a video tutorial, so watch for it! 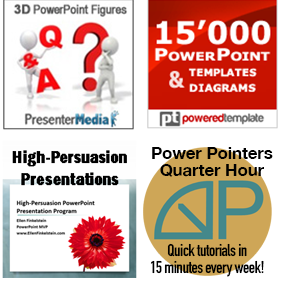 (If you haven’t already signed up for the PowerPoint Tips Newsletter, I invite you to do so at http://www.ellenfinkelstein.com/ppt_submit.html and you’ll know when I publish it. Hi, Ellen. I have access to PowerPoint 2010 and 2013. What I really need to do is to insert an object (ideally PDF but jpeg or other picture format would suffice) in the notes section of my slide. I need to see the PDF during the presentation in Presenter’s view while the audience views the normal slide. I’ve read where the picture is visible when the notes are printed but not during the actual slide show in Presenter’s view in older versions of PowerPoint but thought I saw it is now possible in 2013. I have been playing with this in 2013 but don’t see how to do it or find an article that tells me how to do it. Any help would be greatly appreciated. Thank you. Kelly, I’m not aware of a way to view a picture in Presenter View — only in the Notes pages by using the Notes Pages master. It doesn’t make a lot of sense, but that’s what it seems to me. What’s in the PDF? If it’s text, I’d convert it to text – there are lots of programs that convert PDFs to Word. In fact, Word 2013 can do it. Hi Ellen, I’m using PowerPoint 2007. I have a template which I’m using which I had designed. I want my first slide to include 6 images of business on the page. On the very last slide I want to include the images again but this time I want each image to slide it with the logo of the company beside it. Is it possible to do this? I am using power-point 2016, when I am pasting pictures on to my slide, the picture pasted like very big, not sure why, then I have to re size. Is there a way to paste as it is. I am helping my son with a school project and he is learning PowerPoint in school. He has a simple, 29 slide presentation and he wants the slides to advance automatically. The slides will advance automatically until he inserts a .jpeg image into the first slide and then the presentation hangs on the first slide and will not advance. If he removes the .jpeg image, the files will advance! What are we missing? Thank you so much! This is very frustrating! just wondering if there was a way to add a picture into the notes part of a PowerPoint presentation? we have a chart on the main page, but in the notes we would like to have the table that we could refer to in the notes. Other than typing it out and spacing, is there a fix to that? I have PowerPoint for Mac 2011, version 14.7.1. I’m trying to put a 5×7 .jpg photo into a slide. No matter how I create the .jpg image (scanner, scanner then screen Shot, photo from iPhone) the image goes into the frame at full size, cutting off half the photo and no way to change the size. I’ve tried using Photo Shop Elements to reduce both the size of the photo and the pixel count. I’ve reduced the photo from 5 1/2″ x 7 1/4″ to 2″ x 3″ and 100 dots per inch. When I insert the photo using “insert picture from file” it goes in with just the top half of the photo showing and cannot be reduced in size. When moved around on the slide, only the top half of the photo is seen. I’m using a year old iMac 27″ 5K Retina and macOS Sierra 10.12.2. I’m out of ideas. Help please.